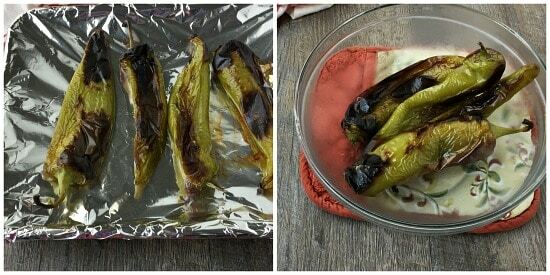 Learning how to roast green chiles at home is super easy! Plus, they taste so much better than the canned green chiles. 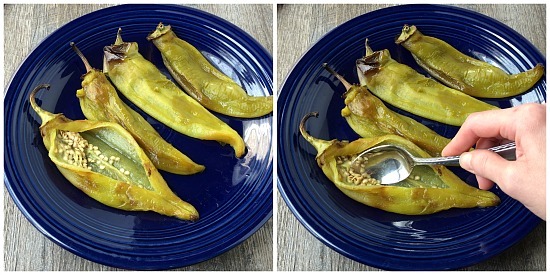 Roasting my own green chiles is so easy I don’t know why I didn’t start doing it sooner. Every year during Hatch chile season, I love the smell of roasting peppers as I enter the grocery stores that roast them on-site. They really do smell amazingly good! Roasting them in the oven was almost just as good. I used Anaheim chile peppers, which are usually pretty mild in heat level. You can find them at most grocery stores. 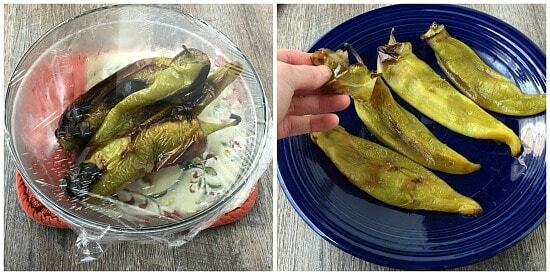 During hatch chile season, you could use those. I roast about four when I make them, but you could roast six or eight, it’s up to you and how many you need. 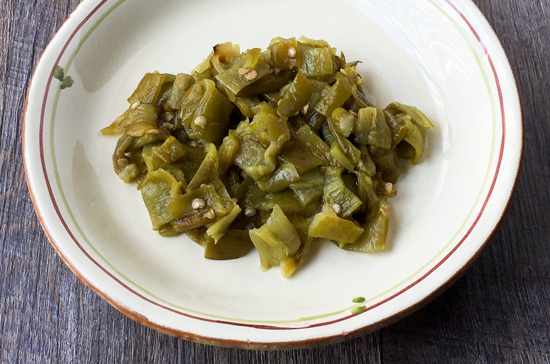 And once you learn how to roast green chiles, you won’t waste your time on the canned kind ever again. 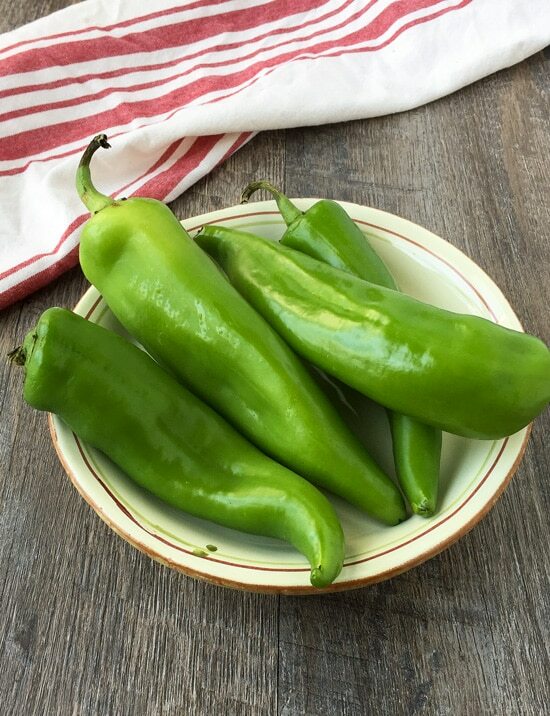 Flat smooth chiles work best for roasting, so look for those when buying. You’ll need to place an oven rack about four to six inches away from the heat element of your broiler. Then, preheat the broiler. 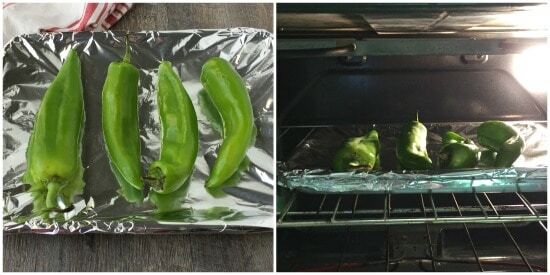 Wash and dry the green chiles and place onto a foil-lined baking sheet. Place them into the oven. Roast until the skins are blistered and charred on one side, about three to five minutes. Then, turn them using tongs and roast on that side until it is charred and blistered, about three to five minutes. You are looking for about 70- 75% of the skin to be charred, not a totally black chile. Remove from the oven and place into a bowl. Cover the bowl tightly with a piece of plastic wrap and let steam for about ten minutes. The condensation will work to help loosen the skins from the peppers. Once cool enough to handle, cut off the stems and peel away the skins. If you want to remove the seeds and ribs, you can cut a slit into the side of each pepper and remove them. You may want to use gloves to do this step. It’s up to you if you want to leave them . I like to leave some in mine. At this point, the green chiles are ready to use. You can leave them whole and make chile rellenos or cut them all the way open and use them whole on top of burgers. Or, chop peppers into desired size and use right away in a variety of dishes or let cool and refrigerate in airtight container. If freezing whole peppers, let cool completely, then place into a freezer bag in a single, flat layer so that they freeze evenly. Another option is to place them onto a parchment paper-lined cookie sheet and place into the freezer until frozen solidly, then transfer into a freezer bag. These will keep in an airtight container for up to a week in the fridge. They will keep for one year in the freezer. Thaw in the refrigerator before using. By Tempie at September 4, 2017 .